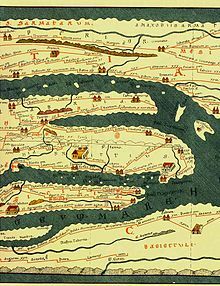 A portion of the Tabula Peutingeriana, a Roman map of the 4th century, depicting the southern part of Italia. Italia was the home of the capital of the Roman Empire - Rome itself. De Reditu, poem by Rutilius Claudius Namatianus, at The Latin Library, describing the decadence of Italia and Rome around 410. This page was last changed on 15 March 2013, at 09:50.